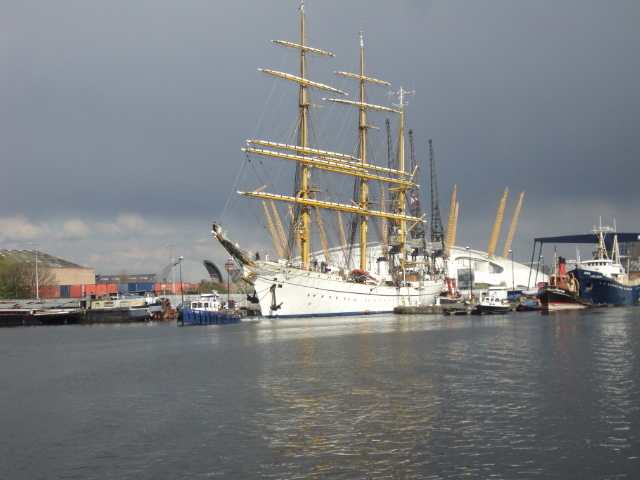 We have been fortunate this year to have had a wide range of visitors to the West India Docks. Let me remind you of some of our most notable visitors. L’ Aigle – Eridan Class Mine Warfare Vessel of the French Navy. A748 Léopard, A749 Panthère, A750 Jaguar , A751 Lynx , A752 Guépard , A753 , Chacal A754 , Tigre, A755 Lion. Clipper around the World Race. 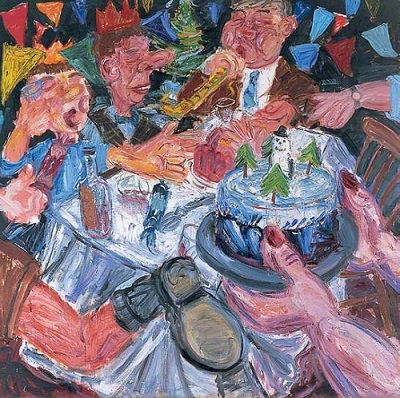 As we edge nearer to Christmas Day, I thought it would be interesting to view how different artists at different times have captured the Christmas Period. 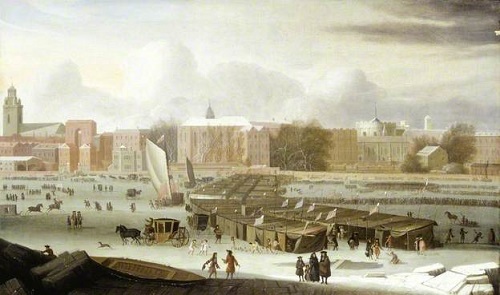 All the paintings have in common that they are either about London or can be seen in London. 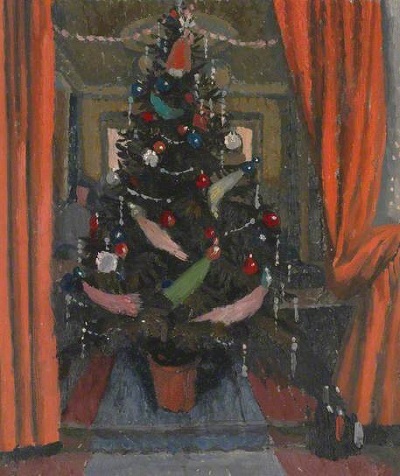 The scene in this painting is Christmas Day 1947 in the Green family home in Lissenden Mansions in North London. It is the only painting of the artist’s parents together (they divorced when Green was 13). May I wish all my readers a Merry Christmas and a Happy New Year. 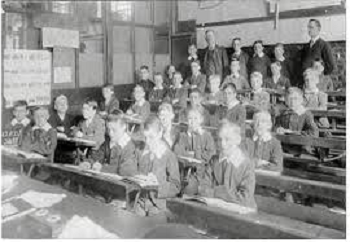 In the early years of the 20th Century, the Isle of Dogs was the location of a radical education experiment by a teacher named Charles Thomas Smith. Charles T Smith developed a system of teaching Music and Drama that enabled children even from disadvantaged backgrounds to learn complex musical arrangements. 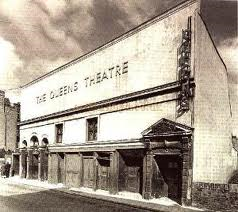 The children of Glengall Road School put on a number of Opera’s and shows which were widely praised. In 1919 Charles T Smith published a book called a Music of Life that explained and promoted his methods developed at Glengall School. The book generated a large amount of interest as the following newspaper report in 1921 illustrates. MUSIC IN THE ISLE OF DOGS. The children who attend the Glengall Road School, situated in the ‘Isle of Dogs’ one of the poorest and most unattractive districts of London— have for some years received a remarkably thorough and comprehensive training in music. In the junior classes special attention has been devoted to time and rhythm, and the children have been trained to execute maypole and morris dances, hornpipes, reels, and other folk dances. They have also been taught to analyse these dance tunes, and to name the various phrases and sections of the music. This training in rhythm is continued in the higher grades, where more intricate movements are practised. Other topics studied in these classes are the evolution and history of music, the development of song; forms, the great composers and their chief works, the development of opera and oratorio, and the various forms of instrumental music. Harmony and counterpoint have been explained with such simplicity and clearness that many children have been enabled to harmonize simple melodies, and even to compose tunes suitable for use in schools. Mr Charles Smith, who has been chiefly responsible for the musical work of this school, has also trained his scholars to give public performances of several well known operas. Such works as ‘Maritana’ and ‘Faust’ (suitably arranged for children’s voices) have been sung and acted by his pupils with wonderful completeness in the matter of scenery and costumes (mostly ‘homemade’), instrumental accompaniment, and other essentials. Mr Smith’s scholars have held their own successfully in other school subjects, as well as in music. Their work is the more remarkable when their uncongenial environment and the poverty of their homes are taken into consideration. Under the title of ‘The Music of life,’ Mr Smith has published a most interesting account of the methods by which these unusual results have been achieved. He has dearly proved that, even in the limited time available for school singing lessons, it is possible to do much more for the musical education of children than has yet been attempted in most public schools. Charles T Smith followed up the Music of Life with another book called the School of Life. The Spectator in 1921 published the following review. The School of Life. 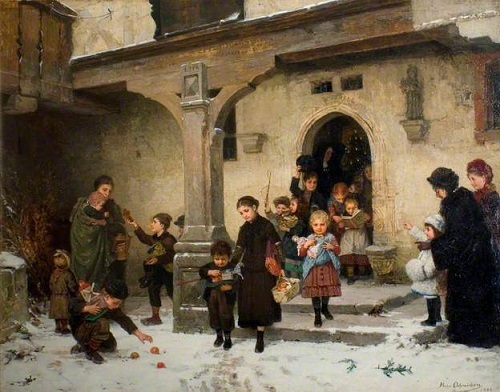 By Charles T. Smith. An account of the attempt of an Elementary School master to educate his scholars mainly through contact with music and the drama. The book illustrates the application of the author’s principles through the performance, by Elementary School children in the Isle of Dogs, of Mozart’s The Magic Flute. Mr Smith is clearly an educational genius. Though his book is extremely interesting and we are in agreement with the greater number of his contentions, he is obviously a man who could infuse life into a study of Sanskrit grammar. Thus, his contention that the drama and music are the readiest methods of humanizing the child, though perhaps true, remains unproved in this book. The Spectator review illustrated the problem facing Mr Smith which was people could see the merit of the approach but thought that it would be more difficult to replicate in other schools. Charles Smith went on to write further books about teaching and became involved in the Rationalist Press Association , although largely forgotten now, his ideas about raising aspirations and developing the talents of children still has relevance in the modern educational system. Recently I was contacted by Coral Rutterford who now lives in New Zealand, she very kindly sent some of her memories of her early life in Poplar and Shadwell. 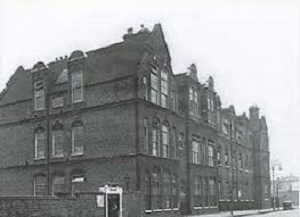 Coral lived with her family in 2 rooms in her grandparents rented house in Bright St, Poplar and about 1949 they moved to a block of flats in Watney St, Shadwell, About 2 years later they moved to St. Paul’s Cray, Kent. 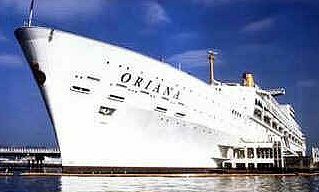 In 1964 Coral and her husband and baby son sailed on the P & O liner “:Oriana” to Auckland, NZ, it was an immigrant sailing with 2000 passengers wanting to settle in Freemantle, Melbourne and Sydney, then onto Auckland. 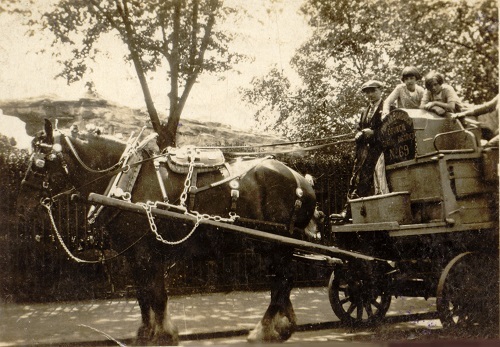 My grandfather was a dustman who worked for Poplar Borough Council and he drove a horse and cart and he used to bring it home and park outside each lunchtime. The horse would then receive his bag of oats or whatever horses eat for lunch. I used to love stroking his head and his muzzle was so soft. Grandfather had a bad accident, he had picked up some French chalk that had spilled inside the high sided cart. He slipped and broke both arms and his kneecap was twisted. He suffered with the kneecap injury the rest of his life, one operation after the other, and he never returned to work again. I attended Alton St. Primary School, Poplar, after the war ended, previously my mother, brother and myself travelled out of London to Staffordshire, Yorkshire, Co Durham during wartime to escape the nightly bombing raids around the dock areas of the East End, I remember vividly sleeping in the Anderson shelter in the back yard amongst the rabbit hutches and chicken runs that Granddad had to help with supplying food for the family and to sell off some at Christmas time. It was a happy time at Alton St, at playtime the kids all played together, all very friendly, with skipping ropes, 2 tennis balls playing up against the walls and a giant ring of kids all playing and singing “The Farmer wants a wife” At assembly each morning we sung with gusto the hymn “Jerusalem” and did those feet in ancient times walk upon fields of green….. there was no fields at all in Poplar at that time. Mr Mills was the Principal and he introduced country dancing and we all loved that and we put on a show for our parents and all feeling very proud to do so. 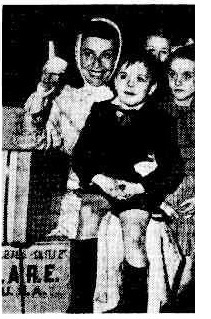 Just before I left the school we had a surprise visitor who was a movie actress Paulette Goddard, who was once married to Charlie Chaplin who also came from the East End, she looked so beautiful in her white rabbit hooded long coat with gold sandals.It was the only school in London that each child received a large 20 pound weight box of goodies of tinned butter, a huge bar of chocolate which was so good as we had rationing for almost everything and confectionery was almost non-existent and other food stuffs that our mothers were grateful for. I had the honour of accepting a parcel from Paulette on behalf of my class and a child from each class also represented their classmates. 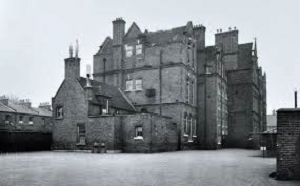 After passing my 11 plus exam I went to George Green’s Grammar School which was in East India Dock Rd at that time and the playing fields were in Millwall where we bussed weekly to play netball and hockey. I used to walk through Chrisp St market on the way to Grammar school and the barrow people were friendly and would say hello and I used to buy a 1d – penny speck apple or pear and eat it on the way home, often I got a nice red apple with no specks. Walking behind a lady one day who had bought live eels from a barrow and they were wrapped in newspaper. I saw them wriggle out into the gutter and slide into a drain, I bet she wasn’t too pleased when she got home. 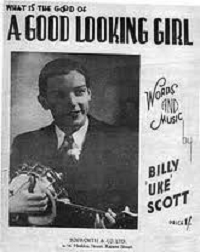 Each Christmas we were treated to a Pantomime at the Queen’s Theatre, in Poplar and Billy “Uke” Scott was the star at one time. Often we would go to Music Hall and I loved seeing the performers singing and dancing and got to learn all the words of the old music hall ballads. “My old man said follow the van” and “For it was Mary, Mary” and the audience would sing along too, good old memories of days long ago when the folk were getting on with their lives after the war years. We moved from Poplar to Shadwell and I still attended grammar school and got a bus each day to ride along Commercial Rd to East India Dock Rd. I enjoyed walking Cable St and onto Leman St to visit “The Tower of London” in those days we just walked into the Tower area and I used to follow the Beefeaters around and listen to their telling of historic facts and I soaked it all up. Nearby is Middlesex St, or Petticoat Lane as it is commonly known for the Sunday market with stall holders lining the street and full of varied goods and often not of value for money. Fast talking barrow boys were entertaining and one had to be careful that during their banter they were only putting 10 apples in the bag but somehow they had counted 12 going into it. My mother was approached by someone/ undercover police? who had been watching this and asked Mum to count her apples and was asked to testify in court. 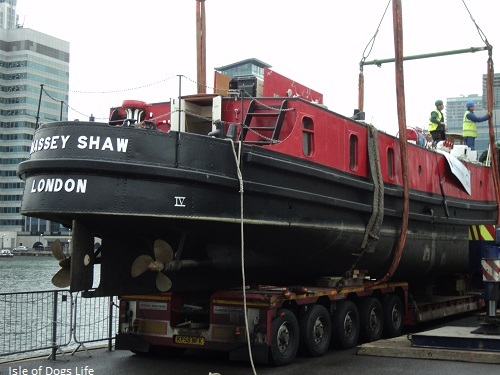 Today we had the arrival in West India Dock of the historic fireboat Massey Shaw. 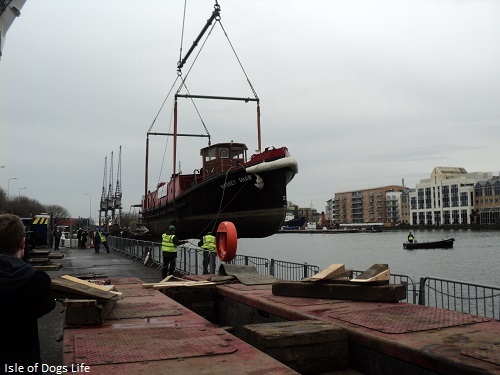 The ship arrived by trailer and was lowered into the dock by a large crane. 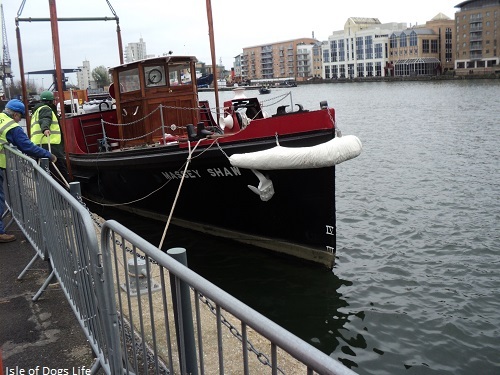 Massey Shaw was a former London Fire Brigade fireboat which was saved by a group of volunteers who have restored the boat to its former glory. 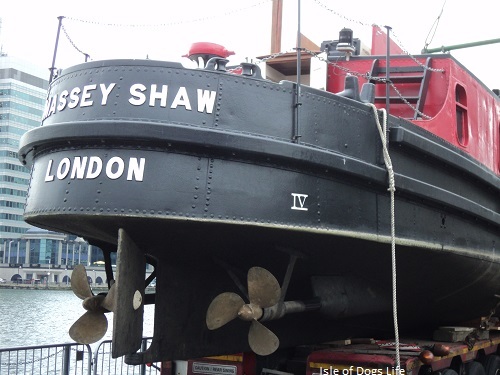 The Massey Shaw was built in 1935 by the J. Samuel White company at Cowes, Isle of Wight. 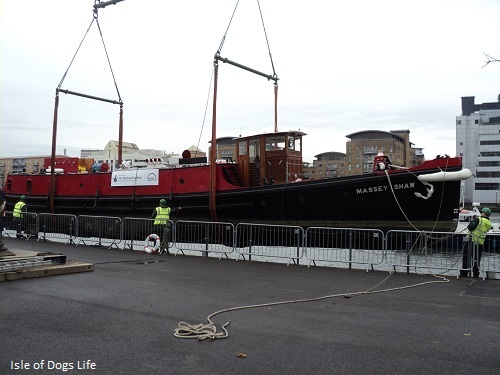 Built to a London County Council design and costing around £18,000 , The vessel was named after Eyre Massey Shaw, a former chief of the London Fire Brigade. When it was delivered it saw action straight away, when it played its part in putting out a major fire in Wapping. A newspaper report of 1935 gives more of the details. Colonial Wharf at Wapping , Sept. 26. Twenty-four hours after the out break of fire at the Colonial Wharf, Wapping, firemen are still at work, seeking to subdue the flames which, though under control, continue to burn fiercely through the lower floors, with occasional explosions. The walls are gradually collapsing, and the stream is flowing with liquid rubber from the burnt stores. The river floats continue their attack on the burning building, and firemen are perched precariously on cranes on adjacent wharfs. Fire engines from all parts of London and the suburbs were arriving during the day, bringing men to relieve those who had been on continuous duty for long hours, and a few of whom had suffered minor injuries. It is expected that it will be days before the fire is extinguished. It spread to an adjoining warehouse today, but was controlled. The district is covered with soot, and the schools and tenements are uninhabitable. 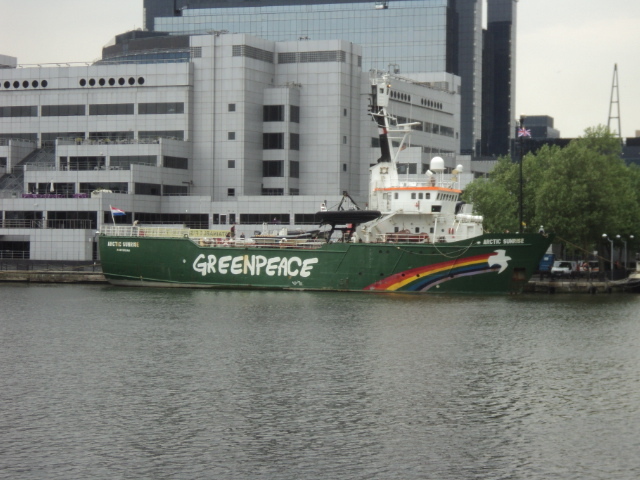 However it was in the Second World War that the boat really made its name. 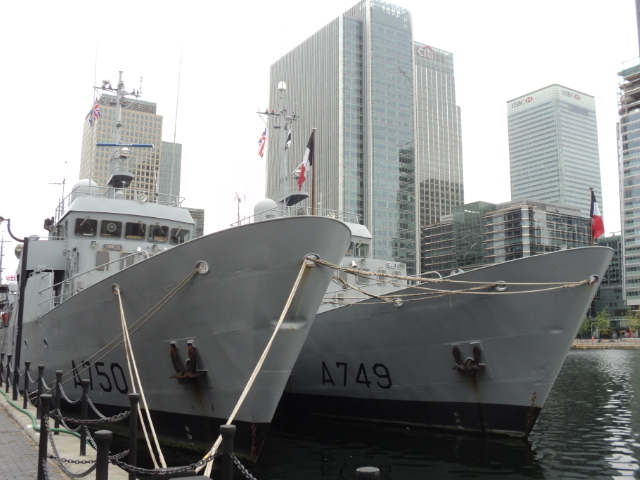 The boat played a major part in protecting the Thames riverside in the war, but it gained national fame by being one of the small boats that went over to Dunkirk to rescue British troops trapped on the beach. Once again a newspaper of 1940 tells the story. Fire Brigade Boat Aids B.E.F. LONDON, June 3.-Among vessels of the great fleet participating in the rescue of the B.E.F., London’s fire boat Massey Shaw was not the least prominent. Volunteer firemen manned the Massey Shaw, and under the command of a naval lieutenant they crossed the Channel on Friday and brought back 60 soldiers from the beach. 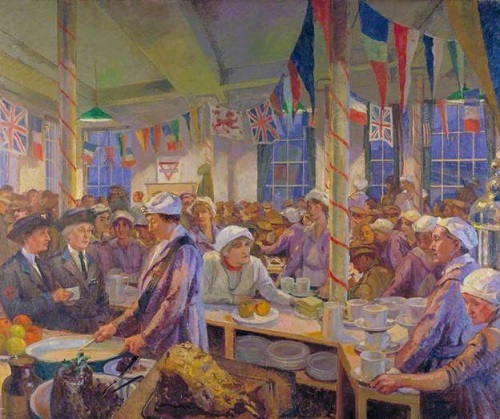 Under a naval crew, she returned to Dunkirk on Saturday and transferred 500 men from the shore to larger ships, and then brought back 46 to England. Later taking aboard a volunteer crew. the Massey Shaw resumed her saving work. 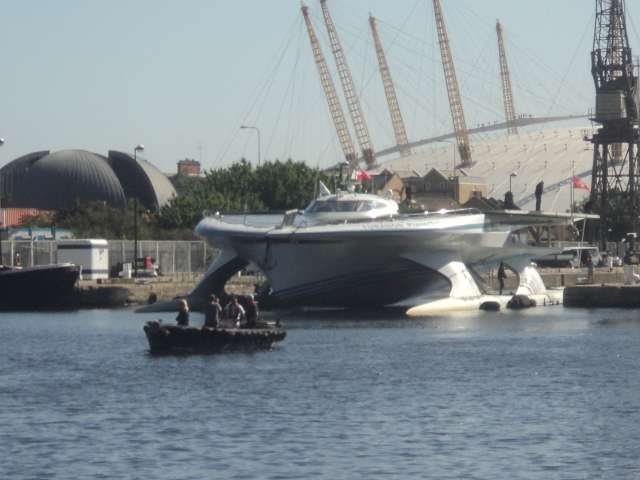 It is understood that the boat will spend the rest of December in West India Dock before making an appearance at the London Boat show at the Excel Centre in early January. 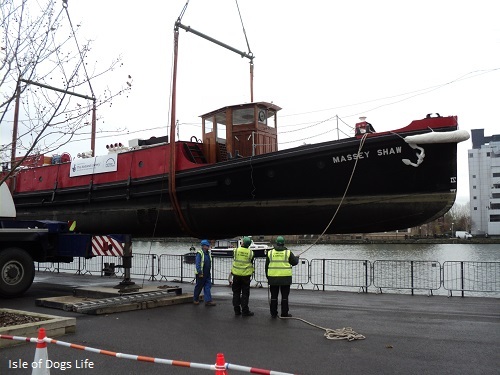 The Massey Shaw has been moved to the end of the South Dock and is moored next to the Lord Amory and the Portwey. The Isle of Dogs was one of the sites considered for the site of the Great Exhibition of 1851, eventually that honour went to Hyde Park. 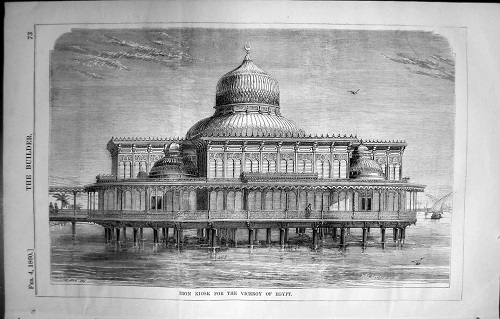 However the success of the Exhibition and the Crystal Palace led to a boom in Victorian Architecture made of Iron and glass. One of the most unusual structures made was a River Palace or Kiosk for the Viceroy of Egypt. 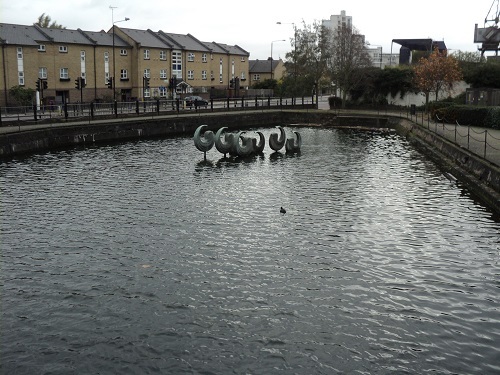 This was manufactured by the famous Ironworks of Henry Grissell at Regents Canal. Henry Grissell was known as ‘Iron Henry’ and had provided high quality Ironwork for prestigious buildings in England, Russia and Egypt. The palace was designed by Robert Stephenson, one of the most famous Victorian Engineers who had played a major part in the creation of the Egyptian railway network. The Viceroy of Egypt spared no expense both in using these eminent Victorians but also in the materials used. In 1858, construction of the Palace began on a piece of land owned by Grissell on the Isle of Dogs and when it was completed became for a couple of years a tourist attraction. The London Journal of 1860 gives more details of the remarkable building. The peculiar building which we illustrate this week is remarkable in several respects, and has been constructed of iron by Messrs. Grissell & Co, from (as we understand) the designs of the late Robert Stephenson. the eminent engineer, The Kiosk for the present Pasha of Egypt will thus form a memento of the genius of Stephenson, of an ornamental character, in contrast with the vast railway works which were carried out in Egypt under his direction. 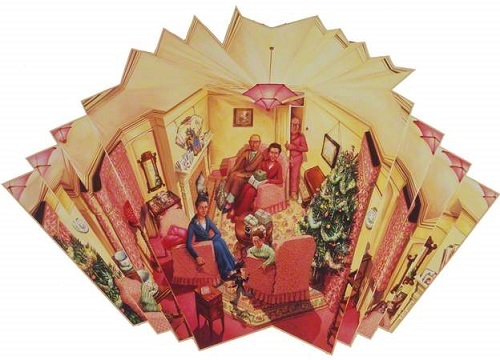 It will be observed, by our illustration, that there is a minor cupola over each of the quadrantal portions of the structure, which, in combination with the large central dome, will produce a fine, picturesque effect. The iron edifice has been put together on a large space of ground adapted for the purpose at the Isle of Dogs, and it is eventually intended to be fixed permanently at Kafrellais. It will stand at some distance from the shore, in the waters of the Nile, the depth of which at this place is 60 feet at its highest rise, and 30 at the fall. The foundations of the building are of cast iron cylinders, which will be deeply embedded in the sand, and be fixed eight feet above the highest water level. Upon the top of these cylinders girders are to be laid horizontally, for the purpose of supporting the lower platform of the structure, which is of a circular form, and measures 120 feet in diameter. Projecting from the outer edge of the cylinders, as shown in our view, are brackets on which a balcony rests. One peculiarity of the building is that a bath will be suspended from the centre of the principal dome by an ornamental chain of great strength, which is ingeniously contrived to pass along the top over concealed pulleys, and then be attached to winding machinery. The style adopted is strictly oriental, partaking of Saraconic peculiarities of detail, and many of the embellishments are of a highly elaborate and decorative character, modelled with great precision and highly finished, and assuredly, as specimens of casting in iron, are amongst the best productions of the kind we have seen. The Kiosk has been executed under the general Superintendence of Mr. Rishton, of the firm of Messrs. Grissell and Co, Regent’s Canal Iron Works, and Mr. Bewick was the practical manager of the operations. which reflect the highest degree of Credit on all parties. concerned, as affording a most excellent specimen of iron architecture and workmanship. 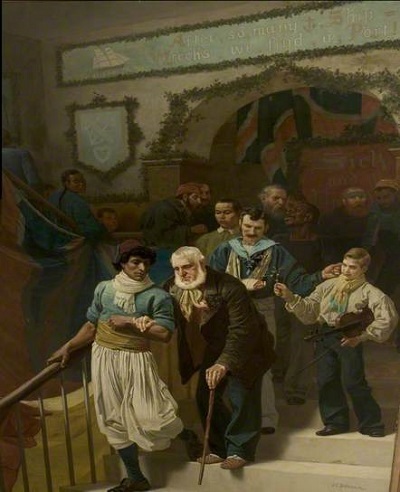 We should rejoice to hear that the Kiosk, under certain restrictions, would be exhibited for the inspection of the public, previously to its being despatched to the sultry shores of the Nile, on which, as we conceive, it cannot be fixed until the autumnal solstice, after the subsidation of the waters of that remarkable river. After 1860 the Palace was dismantled and packed to be sent to Egypt, however by the time the Palace was delivered, the Viceroy of Egypt Said Pasha had died in 1863. His successor, Ismail Pasha did not share his enthusiasm for the River Palace and a later obituary (1883) for Henry Grissell explains what happened next. Henry Grissell was engaged to construct all Stephenson’s bridges over the Nile in Egypt, and other bridges and massive cast iron works. His foundry was used as a laboratory, with pioneering examinations of the strength of materials such as cast iron and concrete. 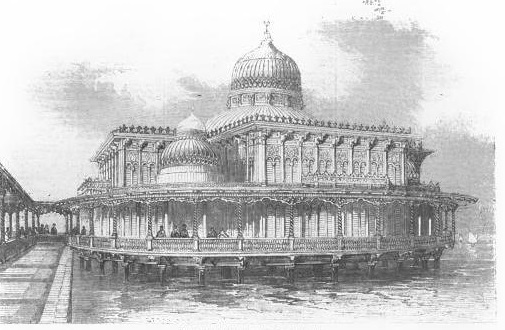 He also pre-fabricated a grand bathing-kiosk or river-palace for the vice-regent of Egypt, which was assembled temporarily at his premises at the Isle of Dogs, where its Minton floor tiles, parquetry-work, stained-glass, and domes became a great attraction. But once delivered, the kiosk remained packed-up at Alexandria as the vice-regent had been replaced and the new one no longer wanted it. It was so grand that it was said to be have been considered for re-use as a railway station! 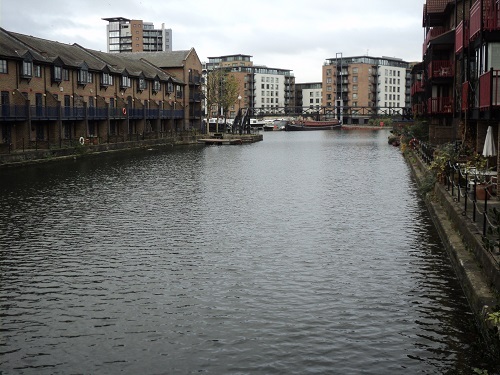 The history of the London Graving Dock is long and varied. 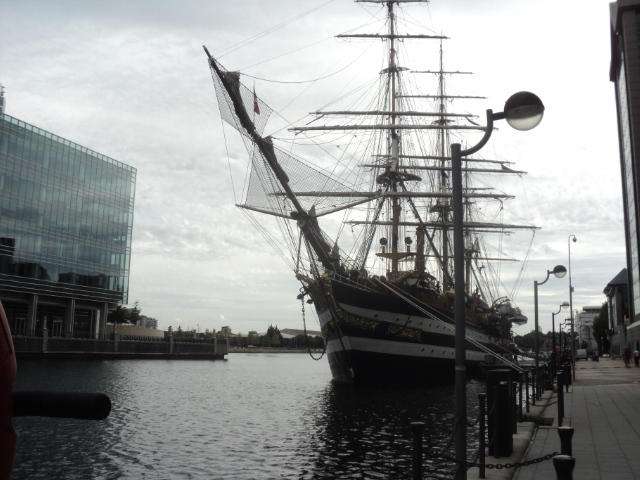 When the West India Docks were built, it was decided that shipbuilding and repair would not be allowed in the docks area. 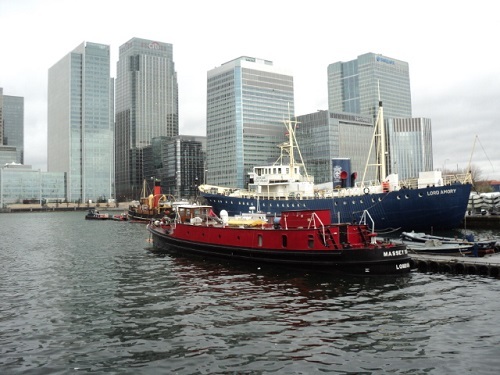 However a dry dock was built in Millwall Docks in the 1860s and it soon became clear that not having a dry dock was leaving the West India Docks at a disadvantage. Eventually there was a change of mind and a small site was found just off Preston Road. The West India Graving Dock as it was named was completed and opened in 1878, it was at the time one of the largest dry docks in the country. By 1890 the site was taken over by the London Graving Dock company who built new buildings and plant and in 1917 extended the site. Although the site suffered heavy bomb damage in the Second World War, it was repaired and the site extended again in 1951. 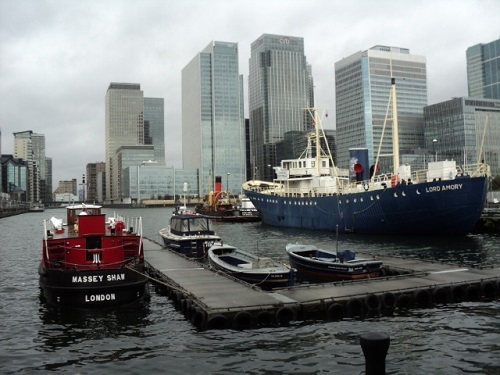 In 1977 the London Graving Dock Company was taken over by British Shipbuilders and made part of River Thames Ship Repairers, however the decline of wet docks was the death knell of the dry dock which closed in 1979. The caisson was removed in 1985 which flooded the dry dock and a concrete bridge built over dock in 1988. The area surrounding the dock was later used for building a number of apartments. Recently I have come across the books of David Carpenter who worked at the London Graving Dock. 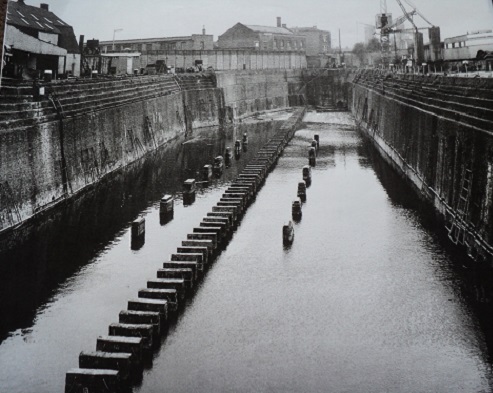 He very kindly sent me some information about the Graving Dock and some anecdotes of working in the area in the 1950s. 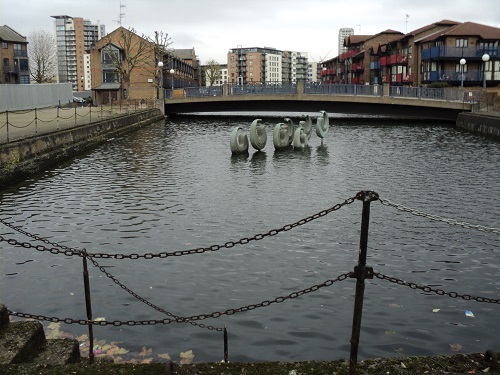 Many people may be surprised where the remains of the Graving dock are actually located . Just off Preston’s Road there looks like a small ornamental pond , a concrete bridge and then a small stretch of water that then feeds into Blackwall Basin. The photographs sent by David show the scene in the 1950s and David explains the layout. The one looking down the dry – dock from approx. where Lovegrove walk (as it is now called) is situated shows the end of the dry dock where the pump room was, at the bottom can be seen the tunnel which extends round Coldharbour to exit into the river beneath the ‘Guns’ terrace. The wooden skin floor of the dry – dock can be seen exposed just outside the tunnel. 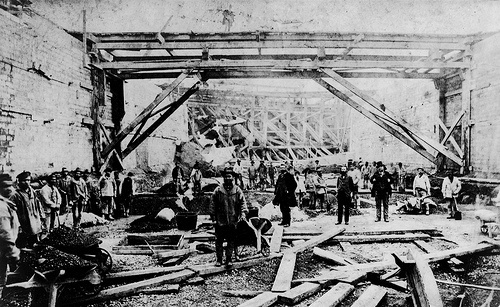 On the left of the picture can be seen part of the Graving Docks Blacksmith’s shop. 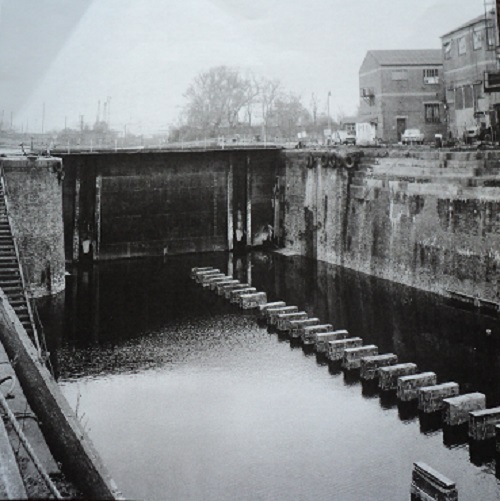 The other photograph of the dry – dock shows the caisson (now gone). On the right behind the tall double doors was the Graving Docks plumbers shop. Beyond the Cassion is Blackwall Basin and beyond this is the entrance to British Railways Poplar Dock. Over the next few weeks I will be posting some more of David’s memories of the Isle of Dogs in the 1950s.